Fmr. Secretary of Labor Robert Reich on FTC: Why Investigate Apple? Investigate Banks! Former U.S. Secretary of Labor Robert Reich weighed in on the whole FTC investigation of Apple. His conclusion? Get your priorities straight, FTC. 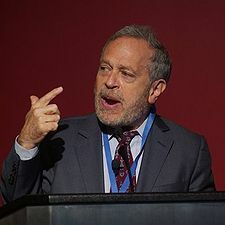 You might remember Robert Reich as President Clinton’s Secretary of Labor, the man largely responsible for the Family and Medical Leave Act who successfully lobbied to raise the minimum wage, an economic powerhouse who was named one of the 10 most successful cabinet members of the century. Or, if you’re more familiar with one-off sketches from Late Night With Conan O’Brien than with brilliant politicians whose far-reaching work has helped millions of Americans, you might remember him as being very short, and standing next to Conan O’Brien, who is very tall. Reich recently gave his two cents on the whole FTC investigation of Apple, and effectively offered a smack down. Why investigate Apple when the case is questionable to begin with, when the four largest U.S. financial institutions are legitimately controlling the U.S. economy? His argument on behalf of Apple, which is being investigated largely due to its decision to ban third-party development tools–anyone who wants to make an iPhone app must use Apple’s own tools. What’s wrong with that? Apple says it’s necessary to maintain quality. If consumers disagree they can buy platforms elsewhere. Apple was the world’s #3 smartphone supplier in 2009, with 16.2 percent of worldwide market share. RIM was #2, with 18.8 percent. Google isn’t exactly a wallflower. These and other firms are innovating like mad, as are tens of thousands of independent developers. If Apple’s decision reduces the number of future apps that can run on its products, Apple will suffer and presumably change its mind. And compared to the situation of the four largest banks in the country, that minor quirk is absolutely meaningless. On the other hand, the four largest U.S. financial institutions are so big and the rest of the economy so dependent on them that if one of them makes a bad decision it can take us all down. Between them they hold more than $7 trillion in assets, over half the size of the entire U.S. economy. So why is the FTC nosing around Apple and not around Wall Street? Because the Federal Trade Commission Act allows the agency to stop “unfair methods of competition” almost anywhere in the economy except in the financial sector. Banks are explicitly excluded. Another reason for financial reform. Reich echoes the conclusions of most tech experts in his analysis of the merits of the investigation against Apple, and it’s great to have someone who’s so knowledgeable about these kinds of investigations, as well as the ebbs and flows of the economy, weigh in and provide some perspective. The Apple story isn’t exactly related to banking reform–I’m sure (at least, I hope) the FTC can handle two things at once–but Reich’s argument definitely reminds us that there are more important things for governmental agencies to be focusing on than an admittedly fun slap-fest between Apple and Adobe.